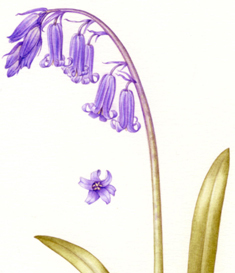 Brocklands was the first green burial site to choose the much-loved English bluebell (hyacinthoides non-scripta) as its emblem: it produces vibrant purple-blue displays across woodland floors during late spring, and is one of the iconic symbols of England. Although it is a plant which tolerates partial shade, it nonetheless requires the light afforded by deciduous trees in the spring to burst forth into flower. It is one of the wildflowers regarded by experts as an indicator of Ancient Woodland habitat and when found out in the open it may indicate where an ancient woodland used to be. 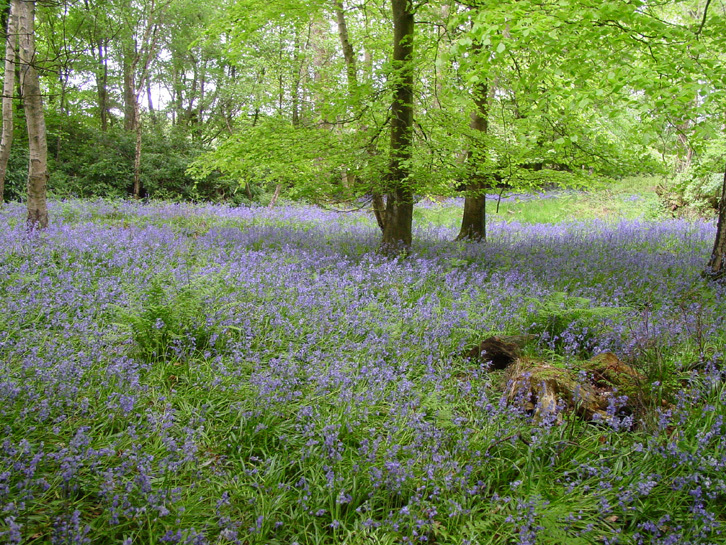 The photo above is from one of the estate's other woods showing how bluebells will spread over time. Not to put too fine a point on it, the Spanish bluebell is a bit of a floral thug, less colourful, stouter and more coarse, but worst of all a usurper of the woodland throne. They can be a little tricky to identify, however, as many are still in the hybrid stage (not properly native or Spanish) so may not strictly conform to the lists above, but appear to have elements of both. However, if any of the 'Spanish' elements are present, then it's not native! 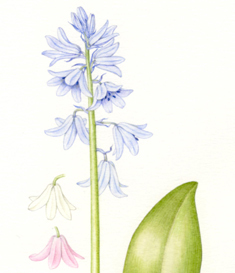 The organisation Plantlife has been monitoring the spread of hybrids and Spanish plants for some years now, and plotting the spread of the Spanish bluebell. (A Plantlife report entitled "Bluebells for Britain" can be downloaded here.) What's worse, we have actually seen bluebells for sale in garden centres which were obviously Spanish but were labelled as just "Bluebells" or even "English Bluebells" - so beware! At Brocklands, every year when the bluebells come in to flower, we have to scan the site for suspicious-looking flowers, as unfortunately, despite our best efforts at advertising the fact, and despite offering native bluebells for sale, some families are still bringing their own plants along. Please don't!